2004's Presidential Election was on the minds of everyone! Our 1st, 2nd, and 3rd grade students held their own election that included elections booths made out of refrigerator boxes and tallying results. To spark their interest, the students wrote on sentence strips how one vote changed many major decisons in the U.S. We positioned these strips on 1/2 of the hallway bulletin board. On the other half, was Countdown to Election Day. Everyday a different student would change the number of days left until election day. The students could not wait to get to 0 and a winner declared! 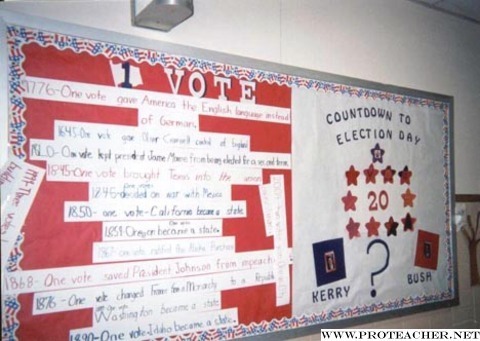 The students were involved with the decorations- making and coloring small flags, writing the sentence strips with markers, and finding prictures of President Bush and his running mate John Kerry. What a great way to boost language art skills and math by utilizing mostly all of the different modalities!